After the gloomy weather the day before on Ben Wyvis, the forecast for today looked a lot more promising. Approaching over the Dirrie More An Teallach stood proud but with a cap of white cloud. The surrounding air was summer blue. Turning left at Braemore Junction we – Peter, DD and myself – sped down the road towards Dundonnell and Little Loch Broom. To our right we could see Loch Broom. We passed Coirehallie where the car park was almost full. 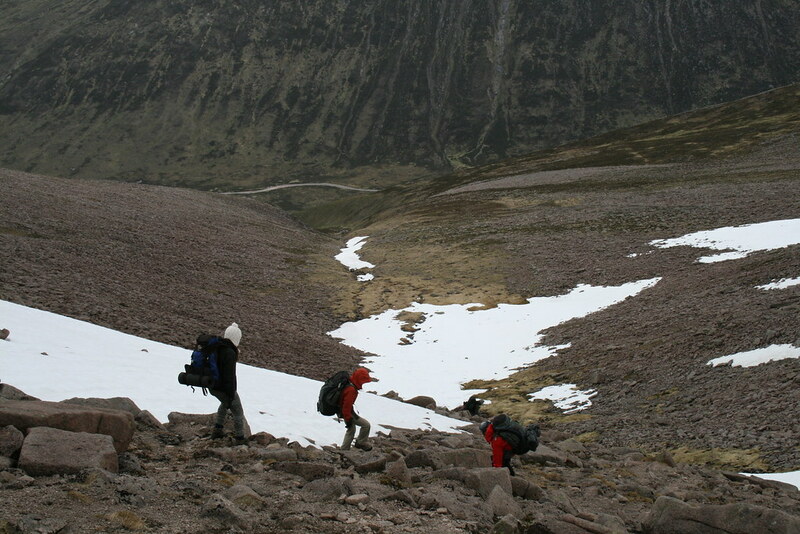 The path then takes you easily up a shallow valley and into Coir’ a’Mhuillinn. Even after only a short dry period a lot of the stream beds were dry. From a long way distant a cairn at the point this path hits the ridge can be seen. My objectives for the day were the two subsidiary tops of Glas Mheall Mor and Sgurr Creag an Eich having previously done the traverse via Sail Liath many years ago. About 500 metres short of the ridge I left DD (for an explanation see my TR on Cairngorm Wanderings) and my brother, Peter, who were going to aim straight for Bidein a’Ghlas Thuill. I took the steepening slopes south eastwards heading for the col between Glas Mheall Mor and point 916 (as shown on the Harveys map). 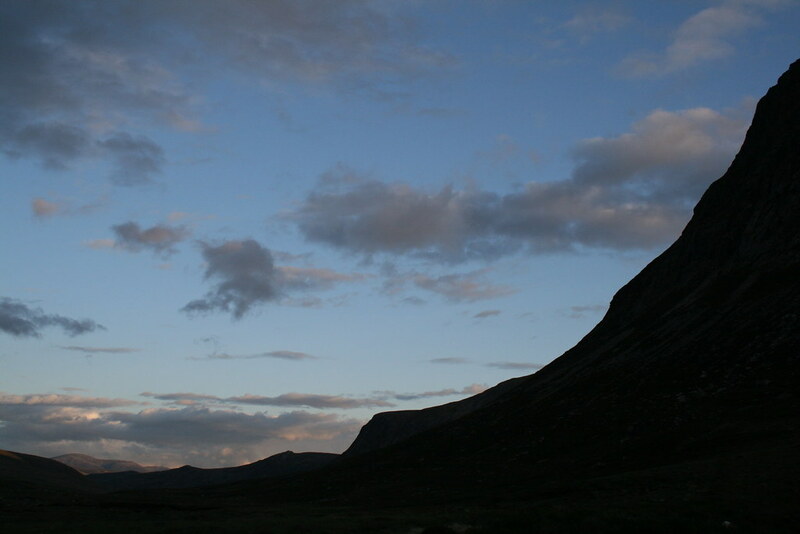 On reaching the col I was met with this view of Bidein a’Ghlas Thuill and its pinnacled eastern ridge. I could see DD and Peter on the slopes of Bidein a’Ghlas Thuill and took this zoomed shot of them about 1km away – DD storming ahead of her uncle. I hurried back along the ridge and over point 916 to the col at the head of Coire a’Ghlas Thuill. I made my way up the same path as the others. 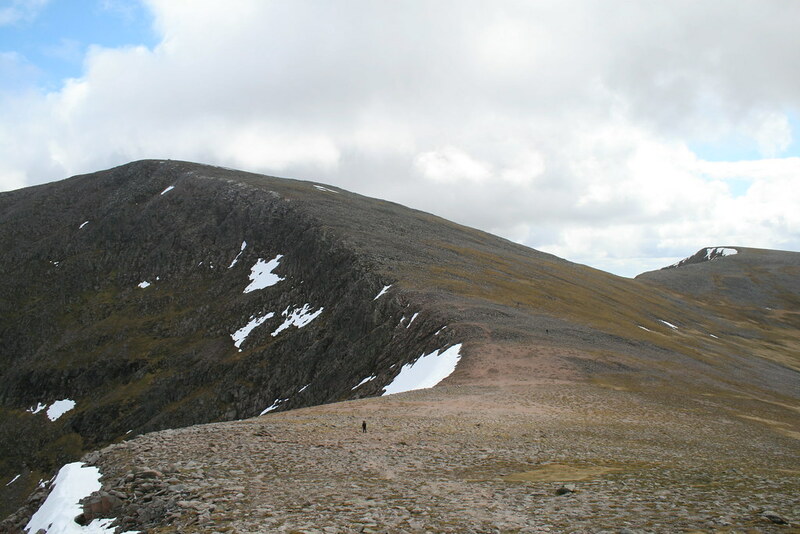 However, if you want a more sporting approach, it is possible (once 30m above the col) to skirt around to the left and to scramble up the true north ridge of Bidein a’Ghlas Thuill. In fact a couple with their two young kids did just this. I arrived at the top about 30 minutes after DD and Peter and just after the family of four. It was quite a busy summit. There was also a German guy and later a Dutch one. Although I did not know he was a WH’er at the time I met with “Snowdonia7” and had a brief chat with him. He had ascended from Shenavall with his fried, Neil. I have, unsuccessfully, been trying to find out how Lord Berkeley’s Seat got its name. It is a rather airy perch – but a good view in clear weather! Now it was a question of getting back. It was 3pm when I left. A stiff southerly breeze sprang up out of nowhere. To the south of the ridge line there are tracks which speeded up the return to the col with Sgurr Fiona. There was then a 50m climb up to the knob of rocks and the traverse down the north west face of Sgurr Fiona. 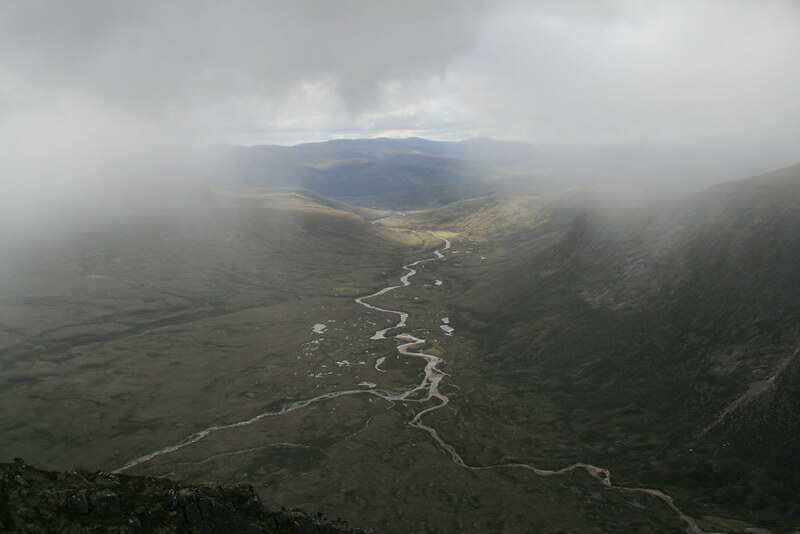 Then there was the prospect of a re-ascent of Bidein a’Ghlas Thuill. In fact a complete re-ascent was not necessary. It was possible to contour around the western slopes without too much difficulty so that it was just 30 minutes from col to col. A rough path skirts around point 916 to the west to the cairn at the start of the path which we had followed on the way up. Notwithstanding tiring legs it was a good romp back down to Dundonell and I was back at the car at around 5pm. DD and Peter had been waiting just 35 minutes. The forecast was not promising. Unfortunately the forecast was accurate and so there are not many photos to share for this one I am afraid. 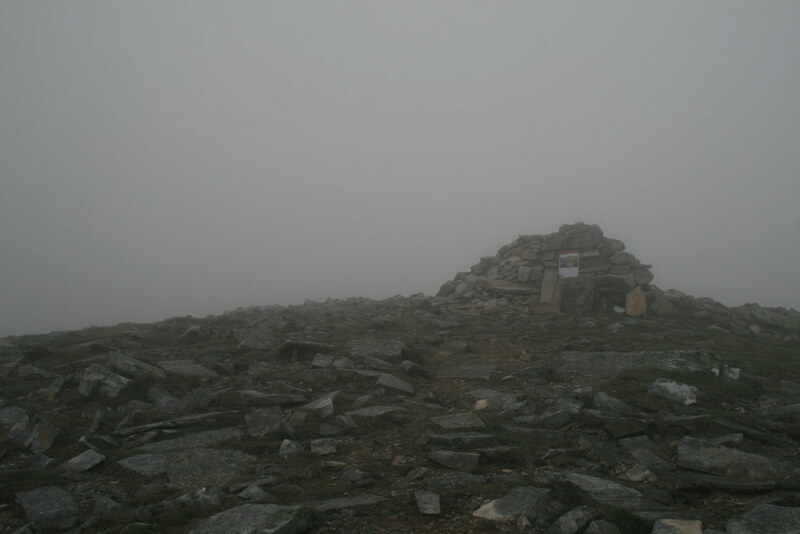 I have been up Ben Wyvis twice before and did not have a view on either occasion. Today was going to be no exception. 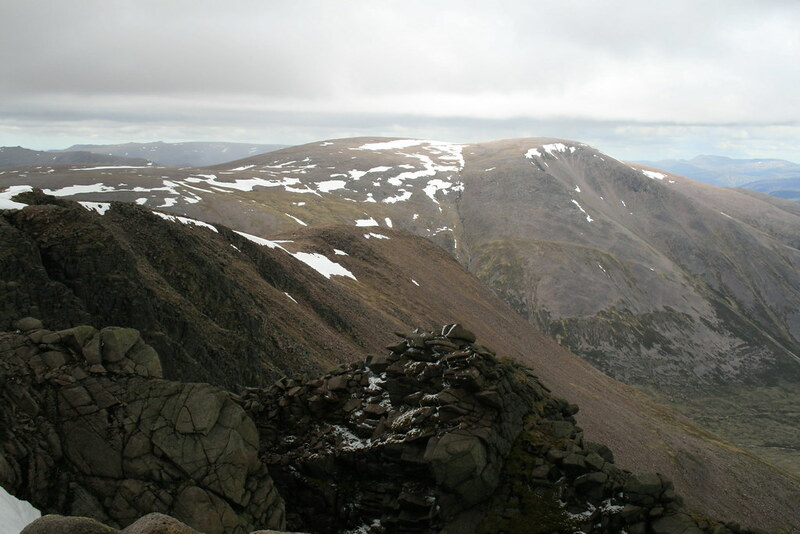 However, the purpose of the climb was that of top bagging, namely Glas Leathad Beag, which lies 4km off to the north east of the main summit. I had considered approaching from the east, up Glen Glass but that would have meant buying another map as the edge of OS20 inconveniently cuts off the far eastern part of the Ben Wyvis massif! On this walk I was to be accompanied by my brother, Peter. When I had last climbed Ben Wyvis the start point was through Garbat Farm along the right of way that runs over the col between Ben Wyvis and Little Wyvis. The path here was normally quite squelchy as it made its way through the forest. 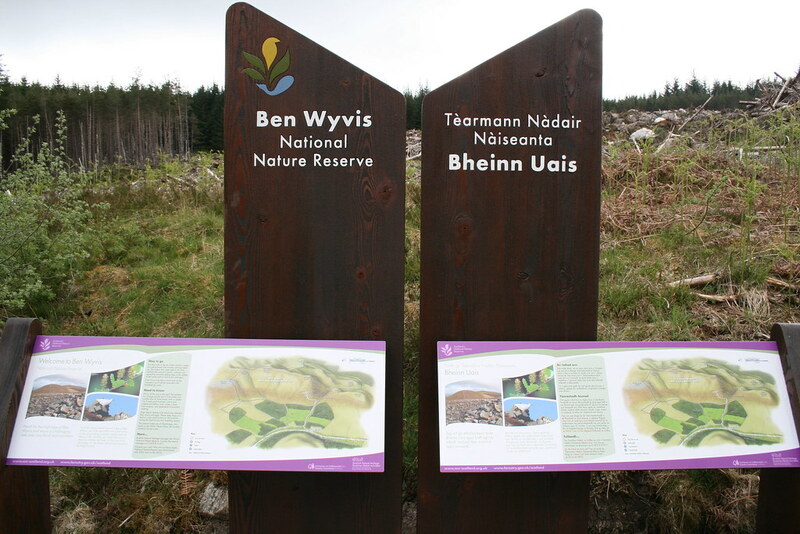 Now, however, there is a purpose built car park about a kilometre to the south from where a fine path leads you along the Allt a’Bhealach Mhor and intersects with the right of way at the foot of An Cabar. So we set off at around 9.30am. The weather was pleasant, mild with a slight breeze. There were even some breaks in the cloud. The path leads up at an easy gradient never far from the river. 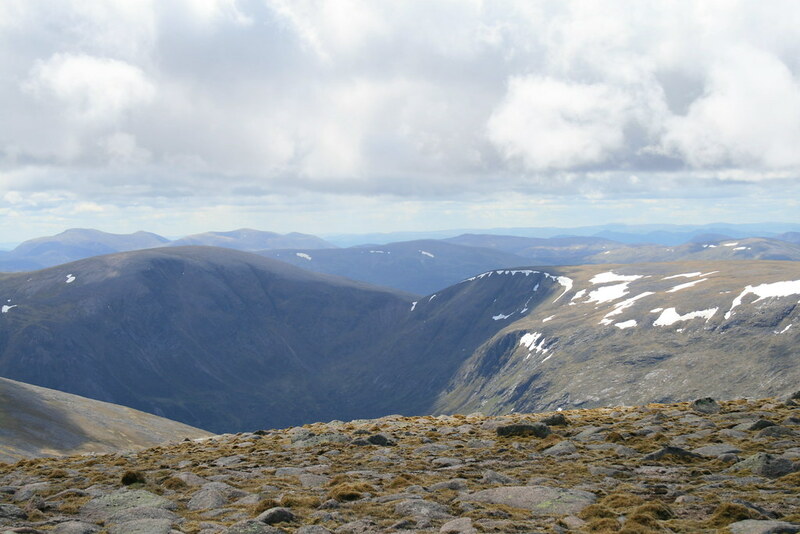 On breasting one rise a remarkable sight came into view – that of Ben Wyvis. What of that you may say. Well have you seen Ben Wyvis quite like this? It was literally wrapped in a blanket of cloud, its shape clearly discernable. The wrapping soon broke up and the rocky shoulder of An Cabar penetrated the cloak. 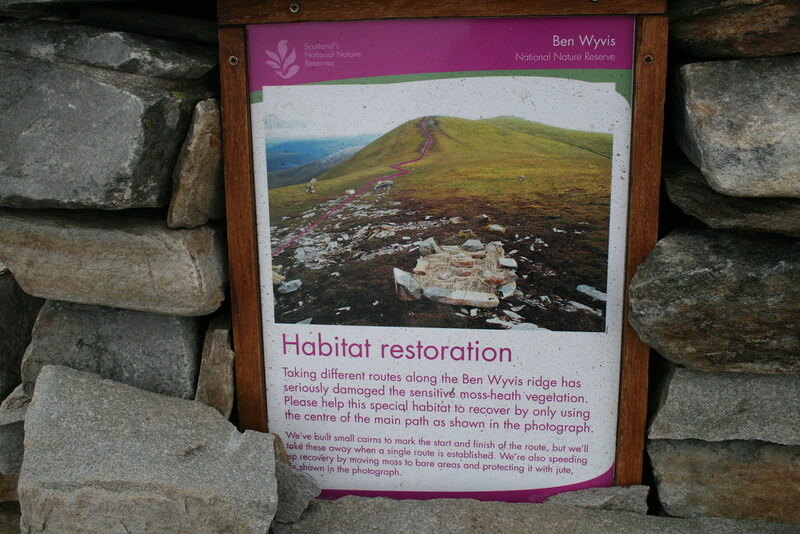 Ben Wyvis is clearly a popular mountain. The path is well engineered and bouldery steps have been created in many places to ease the erosion. You are led swiftly upwards and, in our case, into the cloud. The bulk of An Cabar still provided some protection from the easterly wind but 30m from the top I was forced to put on the cag to protect from the elements. 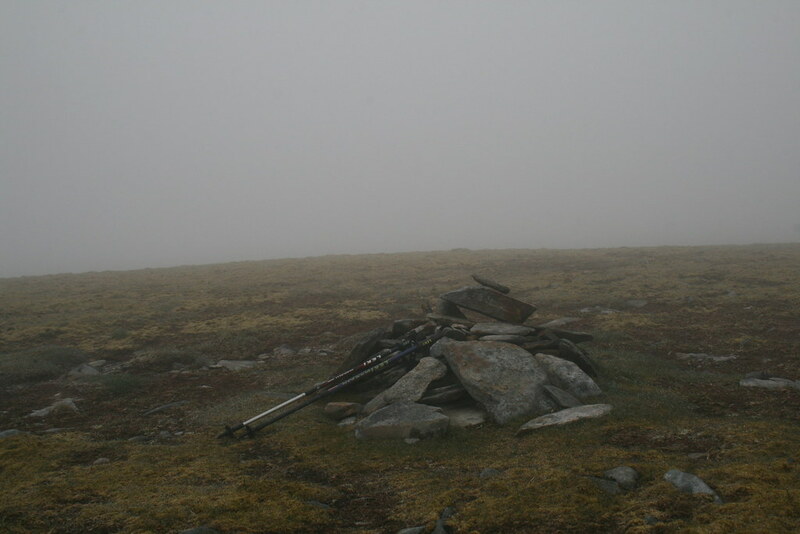 I reached the An Cabar cairn at 11.20am. As a part of access management a sign is built into the cairn. The summit ridge of Ben Wyvis is exceptionally mossy. I did as instructed by the sign. In the mist with about 20m of visibility, the summit seemed to take an age. I understand that there are good views east to the coast and west towards the Fannaichs, An Teallach and Beinn Dearg – but not for us today. I reached the summit at around 11.55am. I hunkered down behind the shelter for a bite to eat out of the easterly wind and the dampness of the cloud. The shelter looks out to the east, no doubt to protect from the prevailing winds. So I sat outside facing north west. Peter followed a few minutes later. He was just bagging the main summit. I plotted my way onwards. He returned the way we had come. After 30 minutes at the summit I headed off. It is possible to contour around Tom a’Choinnich and I set a bearing for the top of the stream at NH467700. I hit it spot on. A bank of snow remained there feeding the sluggish water oozing from a spring beneath. Damp permeated the air and the ground. 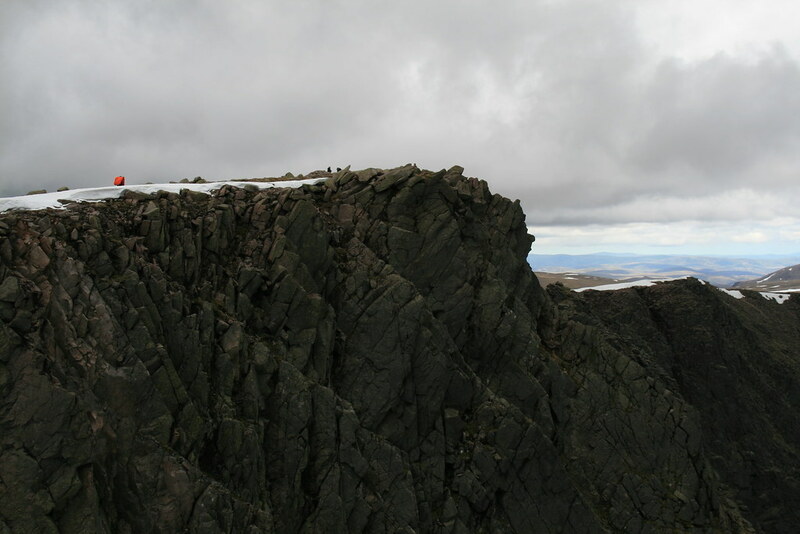 I climbed north for a few minutes and hit a track running down the north east ridge of Tom a’Choinnich. The ground again became very mossy, but a delight to walk over. It was just a shame that I could see no further than my immediate surroundings. So it was onwards, stopping to recheck bearings at each feature and counting paces to double check my location. Finally a wall of green appeared and there was 90m climb up to point 910. Then there was a final kilometre wander to Glas Leathad Beag and its paltry cairn. I guess that there are not enough rocks round about. I arrived at 1.40pm. The track I had been following along this last section veered off to the left of the top so I needed to correct. There was also sign of damage to the fragile surface by ATV tracks – a shame. So it had taken me about an hour and twenty minutes to reach the furthest point – another subsidiary top bagged. Now it was a question of reversing the route over Tom a’Choinnich. Having teased me with a slight clearance the cloud started to drop rain on me. It was actually quite wetting. On the ascent I saw a herd of goats some way to my left. Having reached the top of Tom a’Choinnich I then took the fabulous stalkers path down the north west slopes. Just as the zig zags came to an end I headed south on to the ridge between the Coire Dubh and Coire Tom a’Choinnich. 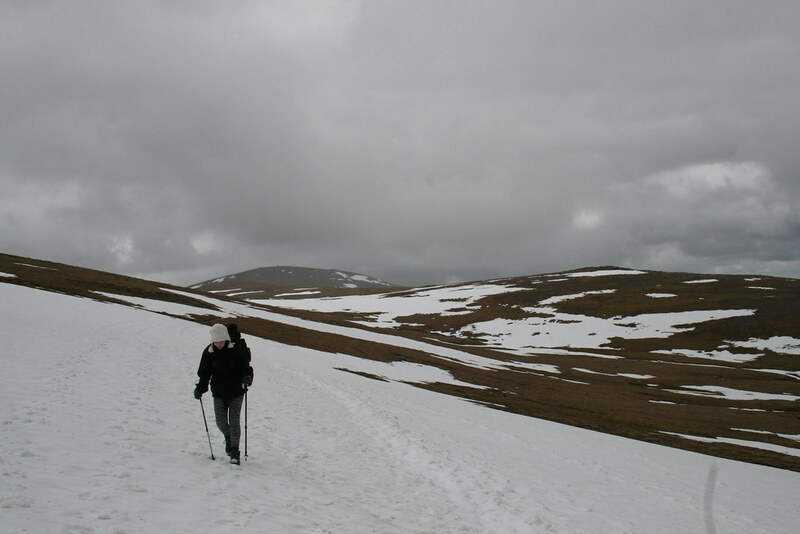 This I followed for a bit before descending towards the Allt Tom a’Choinnich. After a while a faint path appears above the true right bank of this stream. It was relatively dry when I did this walk but I can imagine that it can be quite boggy. It takes you down to the forest. Extensive felling has taken place to the north of the stream. There is a substantial gate at the edge of the forest (or where it used to be) and the path continues to where a forest road crosses the stream. From here there is a choice of routes back to the car park which I reached at 4.40pm. The Jubilee Bank Holiday week had been planned for a while as one for a trip north and, perhaps, something different from a series of day trips. I had (with a bit of bribery) persuaded my dear daughter (henceforth DD) to accompany me. Her idea of fun is normally being physically attached to her Blackberry for hours on end “talking” to her friends. I tell her that “talking” requires the utterance of noise from one’s mouth. She tells me I am out of touch. Alternatively, she is into “style”. A North Face or Rab down jacket would be no good – Jack Wills would be required. This is a 15 year old who will not leave the house without hair perfectly straightened, a skirt rolled at the waist so that its hem line is four inches above the knees and a liberal plastering of make up. Well at least she had agreed to come. To be fair she had, in her more biddable days, scaled over 20 Munros so this was not an entirely new experience for her. But as I say, that was at a time when she regarded what I might tell her as vaguely interesting, informative…and, er,.right. So this was going to be interesting. I was not going to carry any hair straighteners in my rucksack. 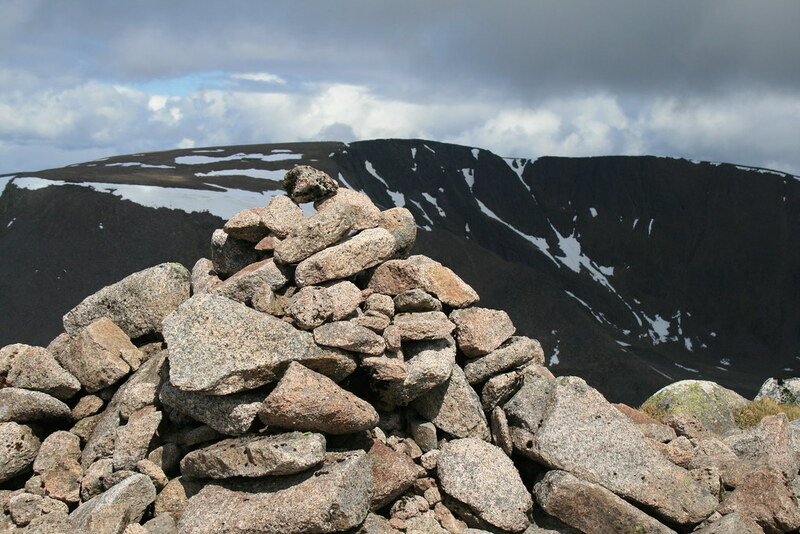 My brother, Peter, inveterate hill list ticker was wanting to do the Cairngorm 4,000ers. 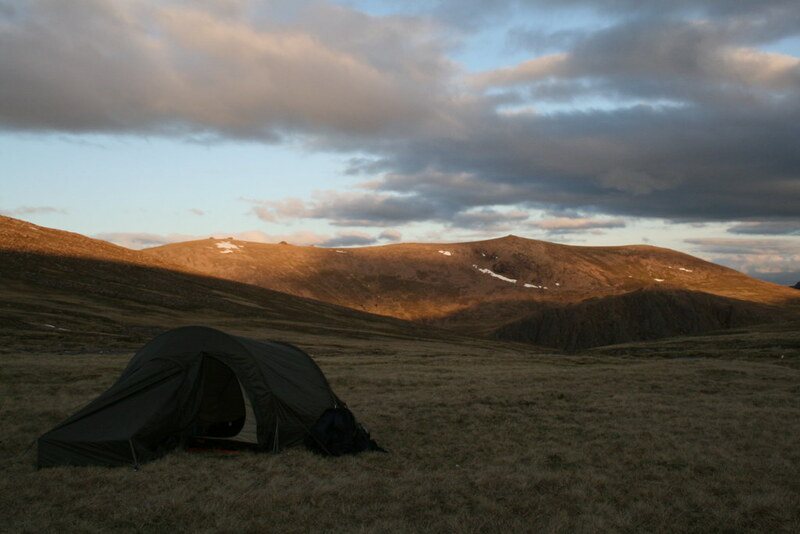 So the Cairngorms it was then. The party was to expand even further, but more of that later. DD had been out at a party the night before to celebrate completion of exams. So we did not make an early start from Yorkshire. My humour was not helped by hold ups on the A1 and, as a result of the Appleby horse fair, A66. So we continued up via Newcastle (where there was another long queue). A Bank Holiday weekend, I should have known better. Once north of Newcastle the traffic became a whole lot better. Good time was then made up to Aviemore where we found something to eat. DD managed 45 minutes sleep as we approached Aviemore. The last thing she now wanted was to start a three hour walk. The last thing I wanted was a grumpy teenager who CBA to do anything. Well at 6.45pm we left the Cairngorm ski area car park. 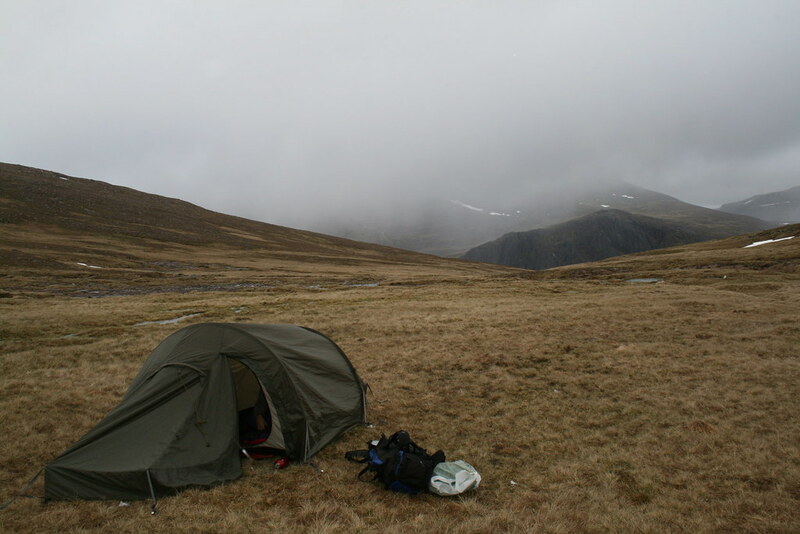 It had been a long held ambition of mine to camp by Loch Etchachan. We did not intend to ascend Cairngorm. DD had done this one before, so what was the point now! So the plan was to hit the plateau either by the Goat Track in Coire an t’Sneachda or over Fiacaill a’Choire Chais and then descend to Loch Avon followed by a short sharp ascent up to Loch Etchachan. This would position us within easy striking distance of Ben Macdui where it was planned that we would rendezvous with Peter. DD struggled on the climb. Looking at the coire rims I had decided to leave the Goat Track alone and we went up Fiacaill a’Choire Chais. Although there were plenty of daylight hours left, it was looking unlikely that Loch Etchachan would be reached that evening. The evening was beautiful. Hitting the plateau the sun was lighting up the cliffs. But it was time for a change in plan. The forecast was relatively benign but temperatures were going to be low. 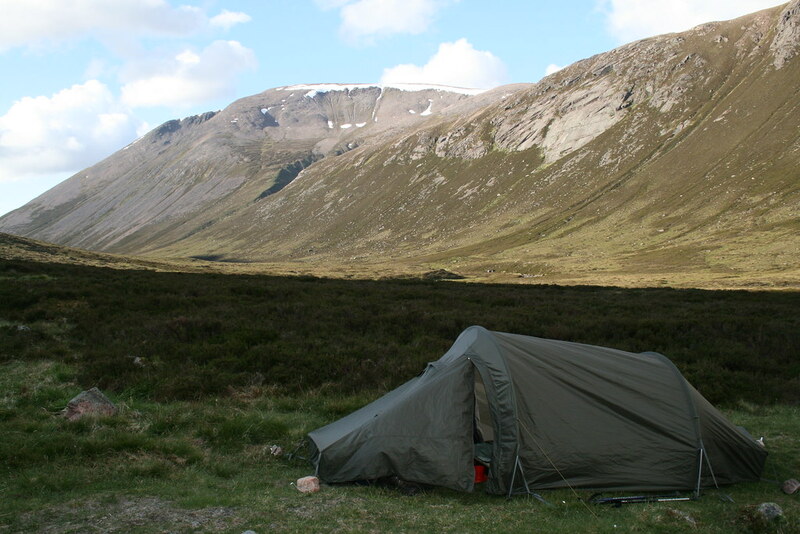 It seemed perfectly feasible to camp in Coire Raibert. 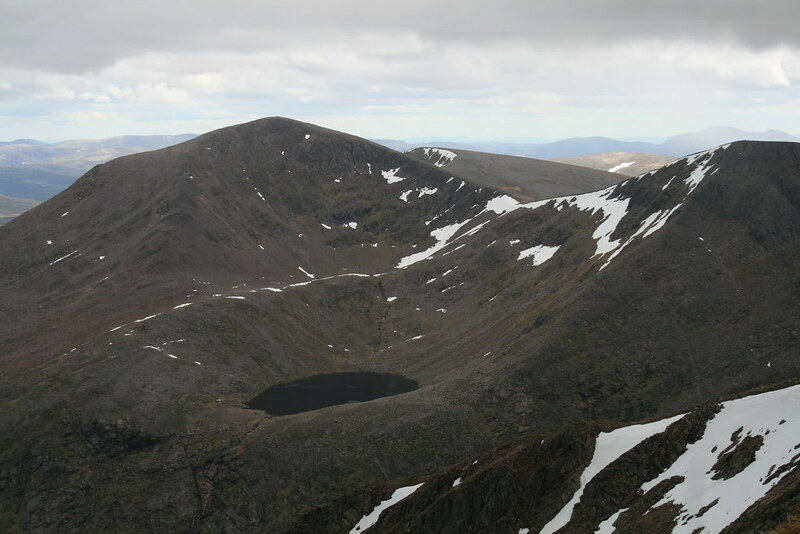 The next day, instead of dropping down to Loch Avon we could traverse around into Coire Domhain and pick up the path to Ben Macdui from there. DD was happy with this plan. So she spied out a suitable spot to pitch the tent – it had my approval if only for the view. We saw a couple of other parties ascending from Loch Avon. 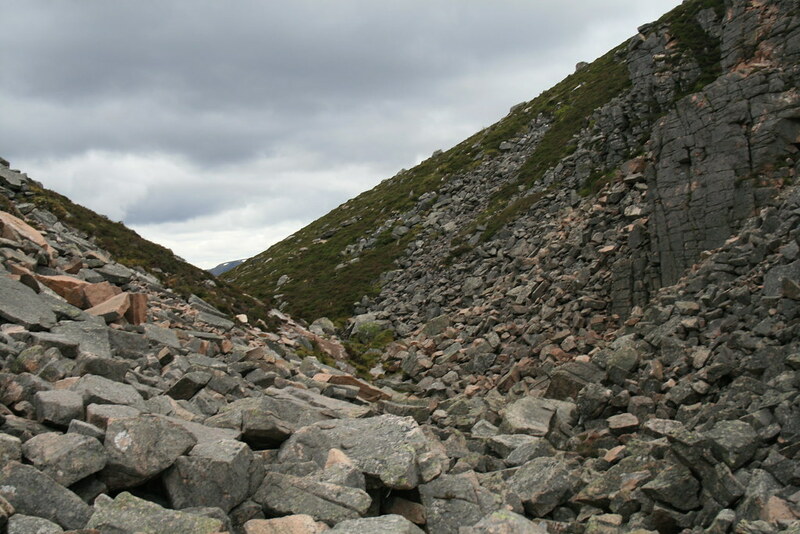 One group of two ascended Cairn Gorm. We settled down for the night. It was cold. Snow showers fell during the night and from time to time I heard snow sliding off the tent. It was a broken night’s sleep. The weather had changed overnight. But we were not in a hurry. We had agreed to meet Peter at Ben Macdui at 1pm. So we had a leisurely breakfast and then festered for an hour or so before packing up. The weather seemed to be improving slowly, as was indeed forecast. Taking a 210 degree bearing we headed over to Stag Rocks. From here we had a partial view of Loch Avon. Onwards we went over a low shoulder and down into Coire Domhain. Parties were long since emerging on to the plateau. 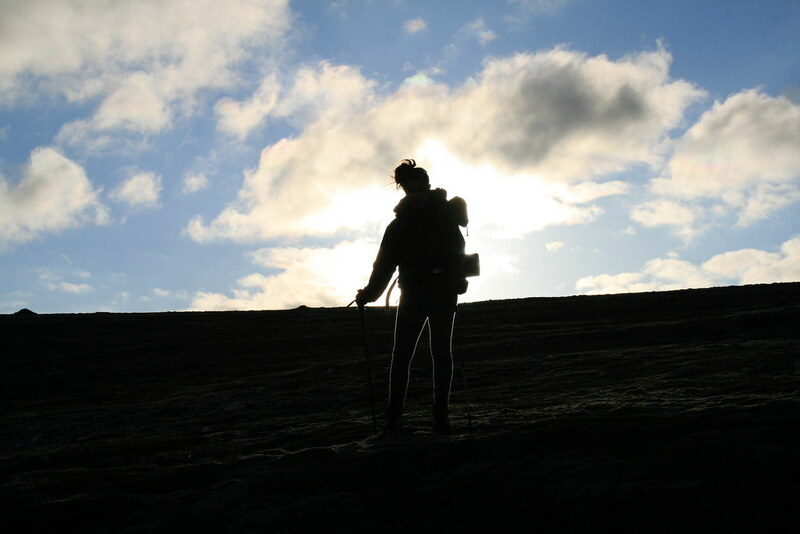 We ascended to the right of the rising ground ahead of us and joined the path that leads from the top of the Goat Track. DD was still not quite with it. After crossing a couple of snow patches, a stop for a flapjack seemed to do the trick. She was off around the head of Feith Buidhe at a great pace, the sugar rush doing its trick. Now it cannot be often that one is accosted in the middle of the Cairngorms by someone who knows your name and whom one has never before met. Well that happened to us. Peter had stayed overnight with friends of one of his sons. So Peter had agreed to bring his son and his son’s friend on our trip. Son’s friend’s parents (Paul and Gill) were the ones who had introduced themselves. 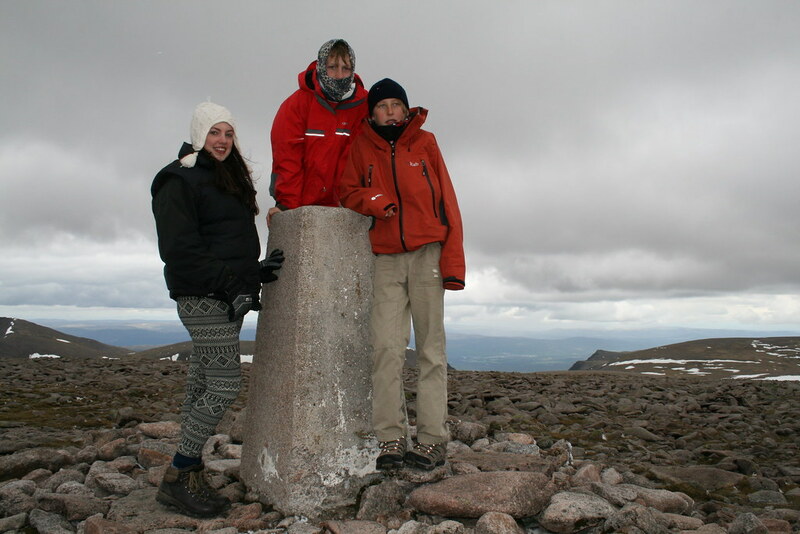 I guess that there were not many middle aged men with 15 year old girls between Cairngorm and Ben Macdui that day, so it was a reasonable assumption for them to make that we were who we are – so to speak. 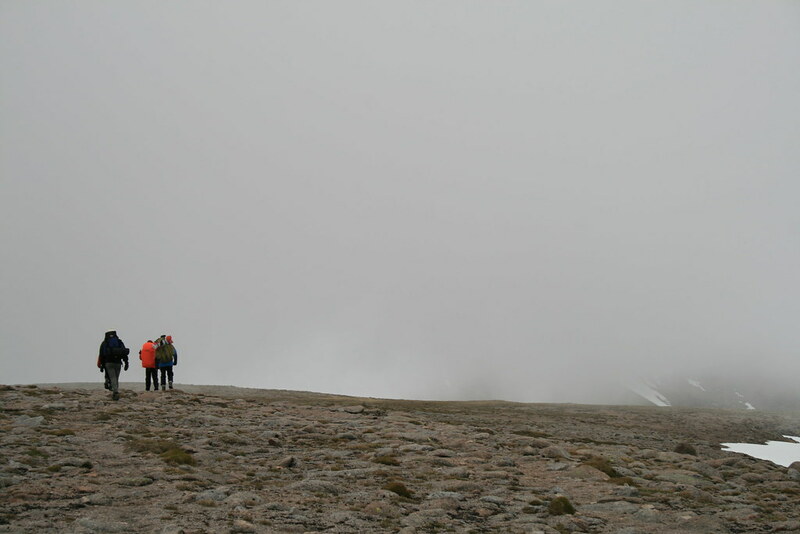 So we continued to Ben Macdui summit together to join the crowds arriving in time for lunch at 12.45pm. There was no sign of Peter. 45 minutes later the two boys turned up. Peter had decided to he wanted to tick off Lurcher’s Crag. So the boys had been sent on ahead. Here is the happy band. We were offered an evening meal the following evening by Paul and Gill – vegetable lasagne. We gladly accepted! The summits were largely clear. The occasional shower passed by in the distance. Ben Nevis was even visible. DD and I had been on the summit for over an hour and we were getting cold. So I agreed to take the kids down to Corrour Bothy (which was the back up meeting point). We went down by the Tailors’ Burn. The kids enjoyed running down the occasional snow patch. 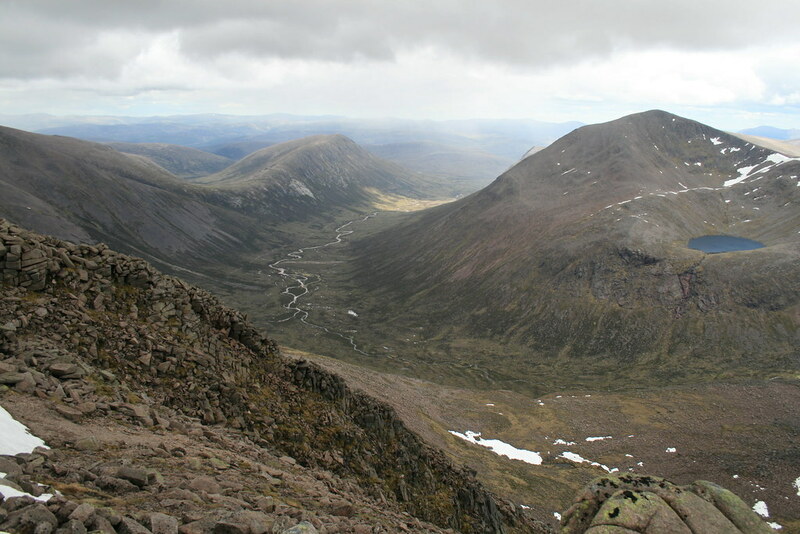 It is a long, long way down into the Lairig Ghru. Lower down the kids entertained themselves by making a collection of frogs. DD decided it was a good idea to keep them in her hat. I had descended the last section more clearly and was chatting to a couple who were having a rest on the main Lairig Ghru path. The conversation somehow turned to frogs and I was asked whether or not DD might have some in her hat. I denied that this was a possibility. Hat, frogs and hair surely did not go together. Having shown just how well I know DD and after a stern rebuke on my part the frogs were released none the worse for their “adventure”. I just hoped that none were particularly wedded to the part of the hill from which they had been snatched because the might have a long journey back. The 1k walk down to the Bothy passed without further incident. We dumped our sacs and awaited Peter’s arrival. There was no room in the Bothy that night, but we were prepared with our tents. 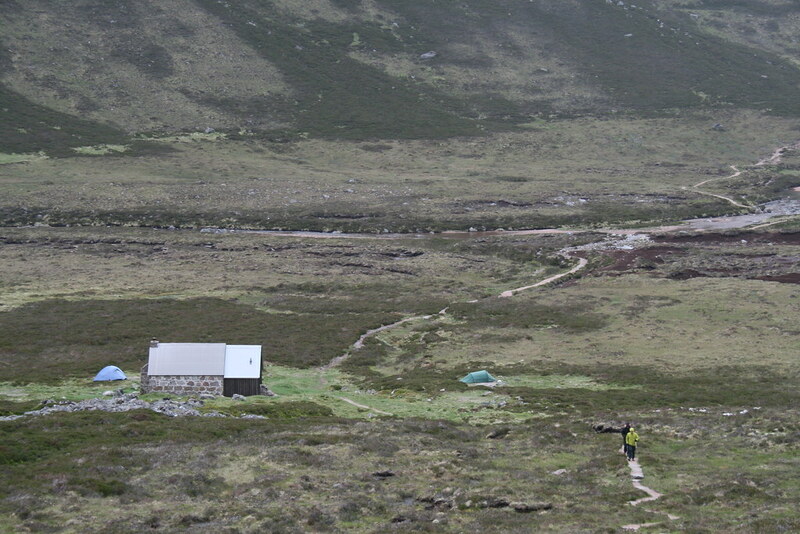 A few others turned up a small tented village sprang up around the Bothy. We fed and watered and settled down for the night. I quickly fell asleep. DD purloined my camera and took a few shots. We were up and away by 8am. Everybody else at the Bothy seemed to have the same idea. 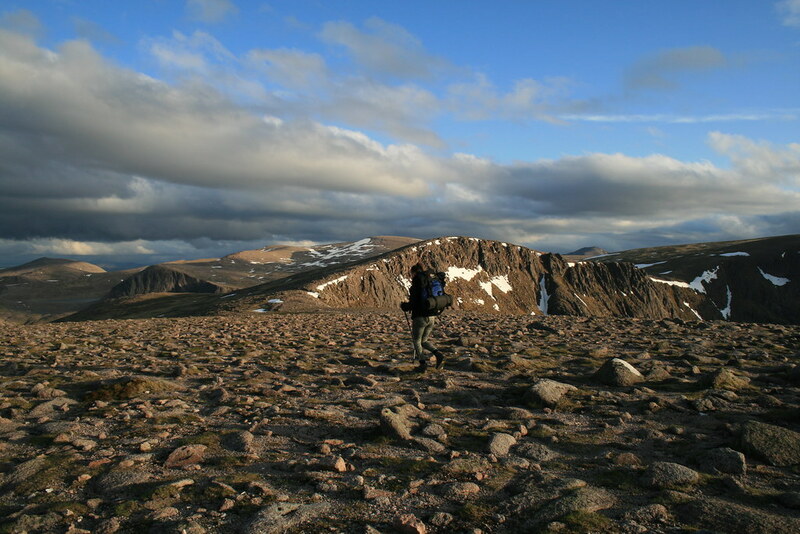 One was walking through to Glen Einich and others were doing a round trip over the tops to the west of the Lairig Ghru and then back to their tents at the Bothy. Only we were walking out. The path leads up behind the Bothy in a pleasing way. The paths around the Bothy have been improved immeasurably from the bogfests that some had become. The weather did not look promising though. but the way the kids had gone did not look great. We were soon following the kids. The slopes up to Stob Coire an t-Saighdeir seemed to take for ever. Teetering across some boulder fields with an unaccustomed weight on my back was tricky. The cloud came and went as did the showers. We passed a walker going the other way. 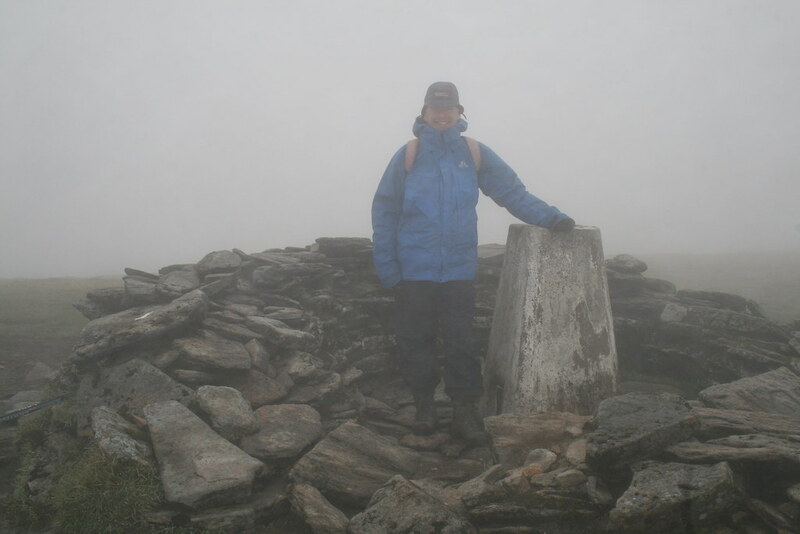 The summit of this Munro top was covered in cloud. The kids had gone on as instructed but I was determined to catch them. I was going well. I found them at the next col where they were waiting. Just beyond there were some convenient rocks to shelter behind and some food was stuffed down them and extra clothing donned. This was the most unpleasant part of the day. Although the showers were wintry, the snow was melting on the clothing immediately it settled. So it was very chilly. Peter arrived and we moved on to generate some warmth from further activity. We were lucky. 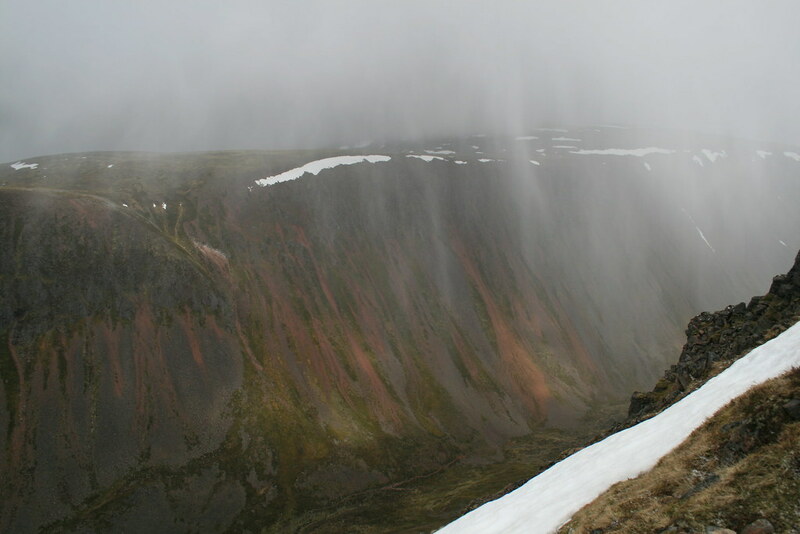 As we approached the summit of Cairn Toul, the cloud lifted and we had widespread views across to Braeriach. We were at the top by 11.15. I had a brief chat with another walker who was doing all of these hills in one day from the north. He had set off around 6.30am. We had a stop for lunch at the col between Cairn Toul and Angel’s Peak. The sun was out but the west wind was still chilly. A fell runner passed by. 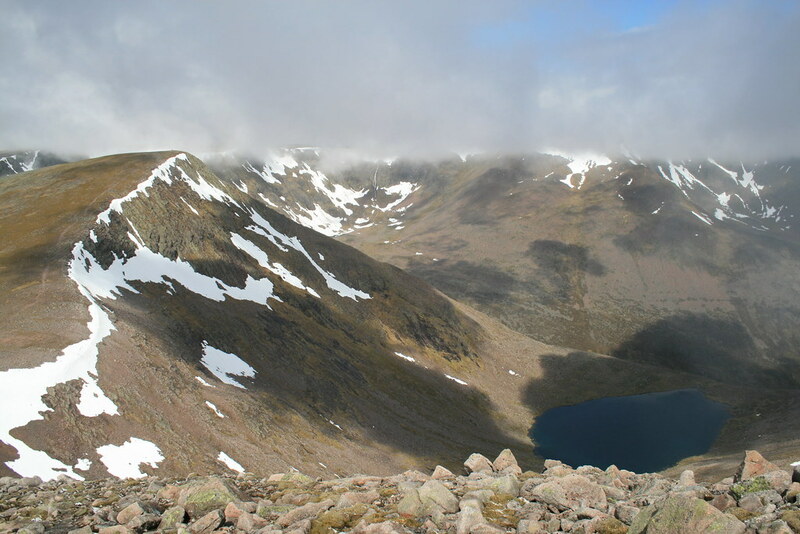 We could see the other parties from the Bothy on the summit of Cairn Toul. The cloud had now lifted off Braeriach. And there were views back the way we had come. The rise up on to Angel’s Peak felt deceptively long, but we were there after our lunch stop less than an hour after leaving Cairn Toul. 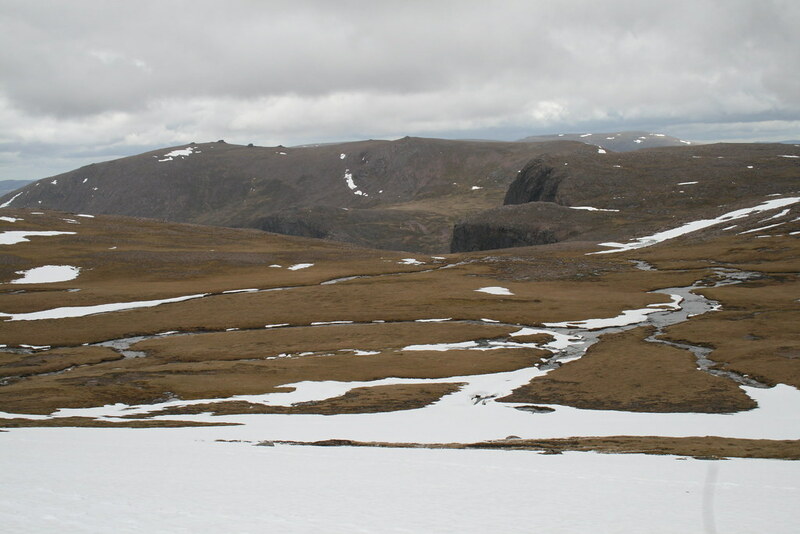 At this point we were still only about half way around the rim of the great corries that bite chunks out of the western side of the Cairngorm plateau. Again the views were opening up. 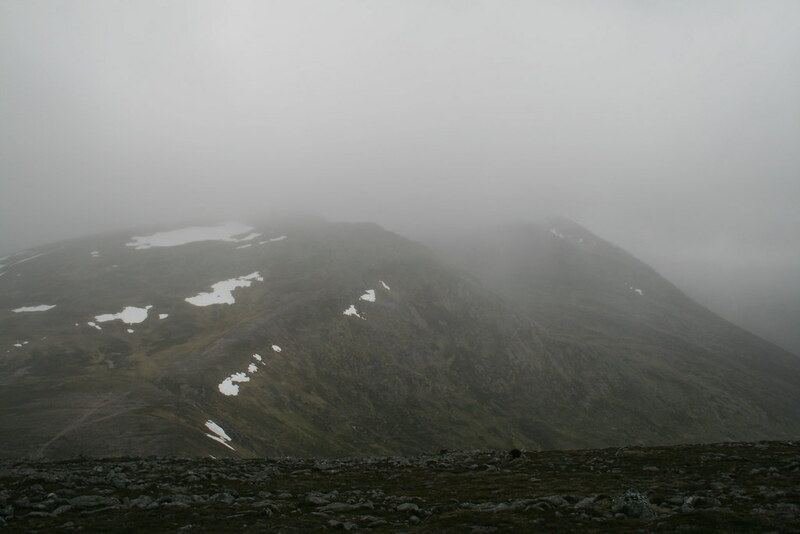 As with the previous day, Ben Nevis cleared. On the horizon we could make out Ben Lawers, Ben More and Stob Binnien, Ben Cruachan, the Glencoe hills, Ben Alder and Creag Meagaidh. It was still cloudy to the north and west. 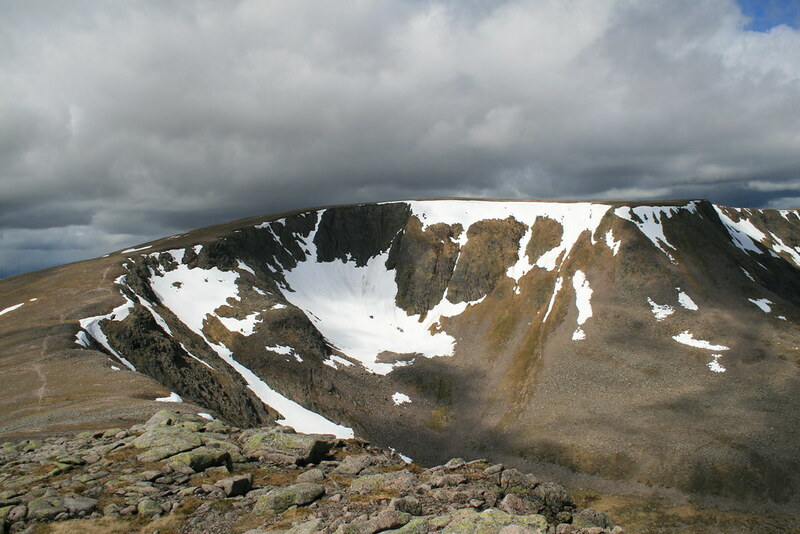 The summit of Braeriach was over 2 kilometres of clear air away. Our route was about double that distance and curved around first to the west around An Garbh Coire before turning north eastwards again. 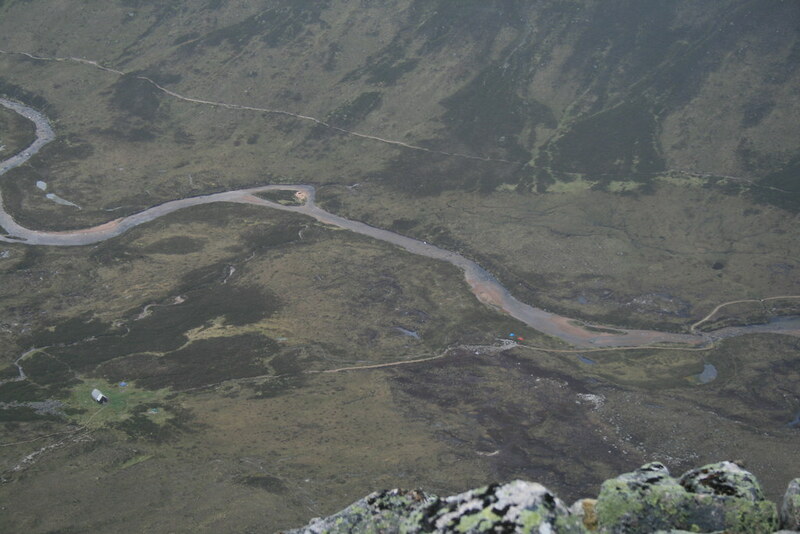 This, I told the kids, was the last major climb of the day – a white lie to keep spirits up, as we still had to go over Sron na Lairig and up and through the Chalamain Gap. 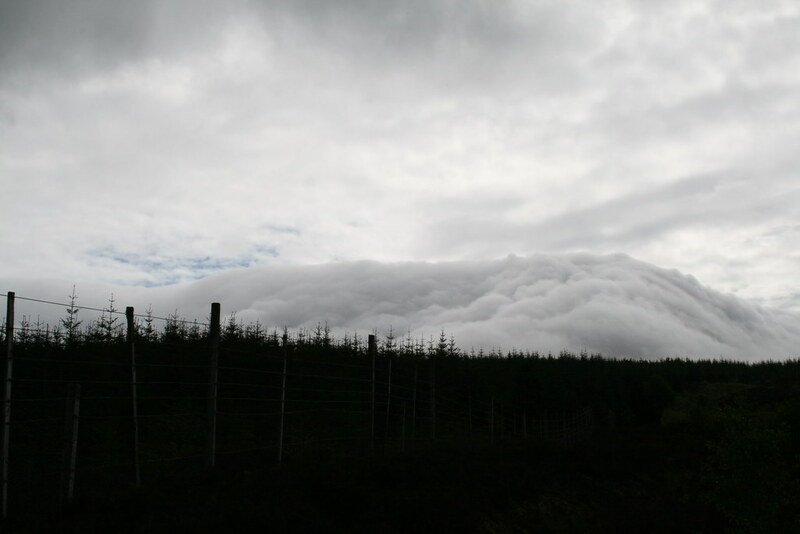 Unfortunately the cloud came down as we crossed the great Braeriach plateau. We were hit with a number of wintry showers again on this leg. The numbers going the opposite way to us increased. But the boys were easy to spot with their identikit orange sac covers. We passed by the nascent River Dee fed by springs and melting snow just to the west at the Wells of Dee. 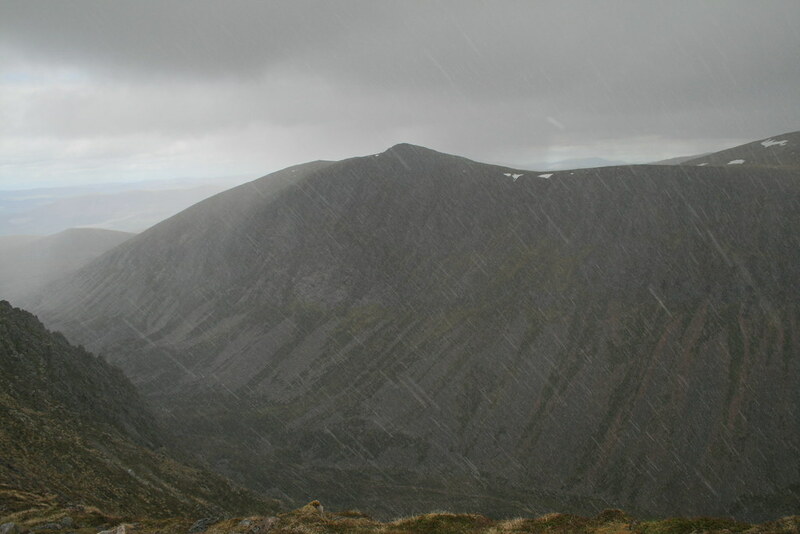 But again the cloud lifted as we approached Braeriach’s summit perched right on the edged of the coire cliffs. We were lucky in having all the main summits clear. We reached the top in good time at 2.25pm. We had a bit of a rest here. There was still a long way to go back to the ski car park. The views are magnificent. 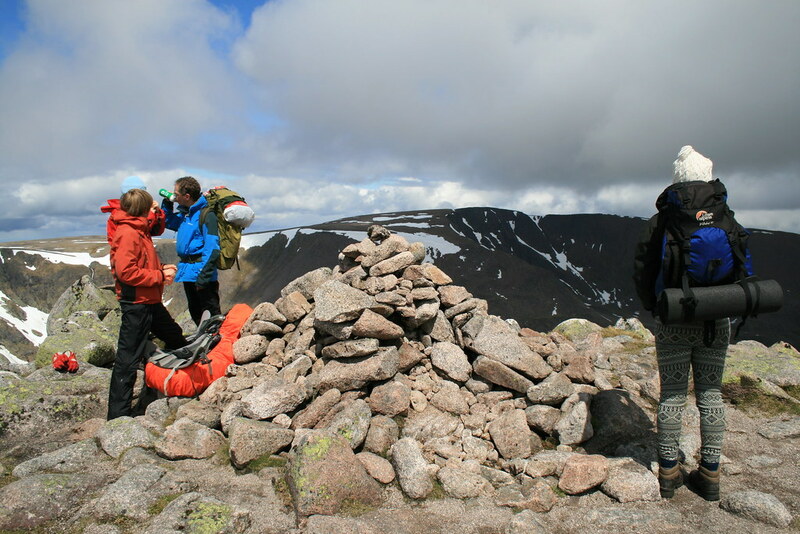 Peter and I bagged the true summit of Sron na Lairig on our way by – the kids were more sensible and just followed the path which bypasses the top by a couple of hundred metres. All we could hear was their incessant chatter! We wearily made our way down the lengthy slopes. We were past caring about the showers that battered us. At the foot of the Sron a good path has been constructed which avoids the direct route via the former site of the Sinclair hut. This site is marked by bright green grass. I went to investigate as I had been in the hut many years ago before it was dismantled. 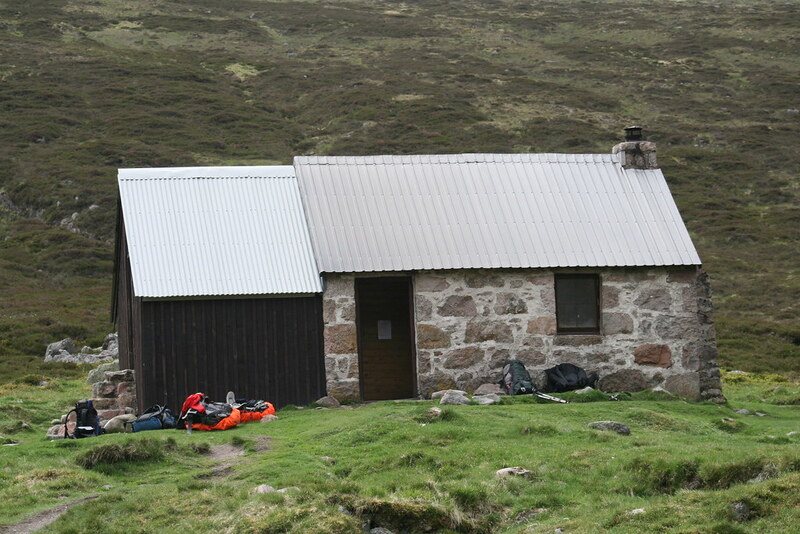 Being on such a popular route it had been abused and, accordingly, removed – a risk overhanging the Corrour Bothy too. One last effort took us up to the Chalamain Gap and the awkward bouldery terrain. The boys with their abundant energy were well ahead of us and claimed that they had run through the Gap. DD was now flagging with sore feet and wavy hair. At the end of the Gap, the well made path continues to the ski road, but 2 kilometres from the car park. I headed off cross country and the two kilometres of rough ground direct to the car park. DD and Peter continued on the path. I heard voices to my right. It was the boys. They too had left the path but mistakenly headed towards the northern corries path. When they saw me they readjusted their route. I wearily reached the car at about 6.30pm almost 48 hours to the minute after starting the tour. I then drove down the road to pick up DD and Peter and to take Peter back to his car. Well done to the kids! Vegetable lasagne never tasted as good!